Forgot to switch out the wash? Get a redo with a little bit of OdorKlenz in a rinse cycle to eradicate that mildew smell. Working in the garage all day? Drive out that stubborn grease aroma. Working up a sweat? Knock out that gym bag stench. Even notoriously difficult towels cannot cling onto musty odors when they are washed with OdorKlenz. The OdorKlenz Laundry Additive is a favorite among our customers because it provides complete odor elimination from such a wide array of sources. Our patented formula is made from earth minerals and non-toxic ingredients so you will not expose your clothes to harsh chemicals, dyes, or perfumes. We also never rely on masking agents so odors are truly eliminated, not merely covered up or mixed with other obnoxious smells. The OdorKlenz Laundry Additive comes in two different versions, a liquid, and powder version. Please read all the product label instructions and follow those directions as best as possible. The instructions below are a step by step guide on how to use both the liquid and the powder OdorKlenz Laundry Additives. Add 1/4 cup (small load) or 1/2 cup (medium or large load) of the OdorKlenz Laundry Liquid Additive with your regular (unscented) detergent. For HE and front load washers, add the OdorKlenz Additive along with your detergent in the designated detergent slot. For top load washers, first partially fill the tub with warm water, and then the clothing last as the water continues to fill. For best results use warm water and do not use in combination with bleach or vinegar! 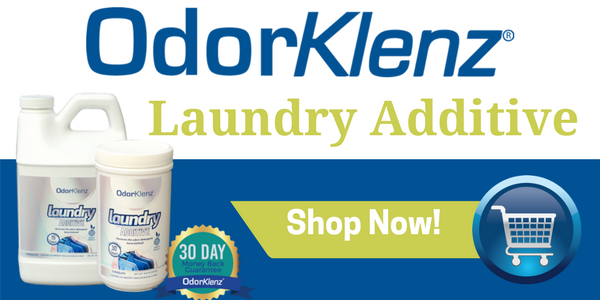 Add 1 scoop (small load) or 2 scoops (medium or larger load) of the OdorKlenz Powder Additive, along with your regular (unscented) detergent to eliminate odors from your laundry. For HE and front load washers, add the additive along with your detergent in the designated detergent slot. For top load washers, first partially fill the tub with water. Next add your normal detergent, followed by the Powder Additive, agitate the powder in the tub with warm water and then you can add the clothing into the machine. OdorKlenz Laundry Additive is available in Powder or Liquid forms. Safe for use on cotton, personal delicate, nylon, polyester, spandex, washable lace, washable rayon, washable wool, and all other washable fabrics. The product should not be used in combination with bleach or vinegar as this will limit overall effectiveness. Removing mildew odors from clothes was once a difficult task, but now you can safely remove musty odors from clothes and linens without the use of harsh chemicals or masking agents. Clothes that were left in the washer overnight often headed right to the trash but now you can salvage your neglected laundry by washing them in a load of OdorKlenz Laundry Additive. The OdorKlenz Laundry Additive can be used in a variety of applications such as the ones listed below. OdorKlenz known that many people like to soak their clothing or washable items, especially when they become contaminated with chemicals or odors. The process of soaking your clothing can serve useful to get out some of the most stubborn odors from your fabrics, as well as reduce pollutants from going into your washing machine. Following our step-by-step process below will help you to properly soak your clothing using the OdorKlenz Laundry Additive. Select a bucket or container that will comfortably hold the items you are wanting to soak. Fill the empty container with enough warm water that it will fully cover the wash items. Next, add our Liquid Laundry product (1/4 to 1/2 cup). Agitate to disperse the product in the bucket. Add the clothing items you wish to soak into the bucket/container. Let the items soak for at least 30 minutes (longer time periods will increase effectiveness). If the Laundry product looks like it has settled to the bottom, be sure to agitate to resuspend the product. After you soaking period is over, remove the items and place them in the washing machine and follow your normal wash care practices as recommended by your clothing label. Agitate occasionally during soaking to increase success of the process. Use warm water instead of cold water in the soaking process and in the washing machine. Extra rinse at the end of the cycle for the washing machine. Overload the soaking container. Over loading makes it difficult for the product to work properly. Do not use in combination with bleach, vinegar, or other additives. These counteract the efficacy of our product.